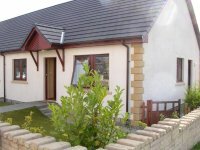 Creag Mhor was completed in 2004 and is located in a quiet cul-de-sac at the north end of Aviemore. The property, built and furnished to a high standard, provides a relaxing environment from which to enjoy a holiday break in Aviemore. Creag Mhor has a fully enclosed south facing rear Garden with a brick built barbeque and timber decking area to make full use of the uninterrupted views of the Cairngorms. The property has all modern appliances including Washer/drier, Dishwasher, TV with Skybox, Microwave etc. Visit the Creag Mhor website for more information.